Critical Thinking Tip #7: When your student finishes math problems, ask them to teach you how they came up with that answer. Then discuss if that method and answer make sense. From listening comes wisdom and from speaking comes regret. 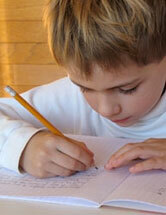 Many kids need to make mistakes before they can take full responsibility for their schoolwork and belongings. The best way is to review what is the right way of doing something and provide reminders. However do not rescue them by doing the task for them. They will learn from their mistakes. Teach your children that how you say something is as important as what you say.